[124 Pages Report] polyphenylene market is estimated to be USD 3.12 Billion in 2017 and is projected to reach USD 4.99 Billion by 2023, at a CAGR of 8.2% during the forecast period. The polyphenylene market is driven by the growing use of polyphenylene in automotive and aerospace industries. The increase in the consumption of polyphenylene in the filter bag application will also drive the market. 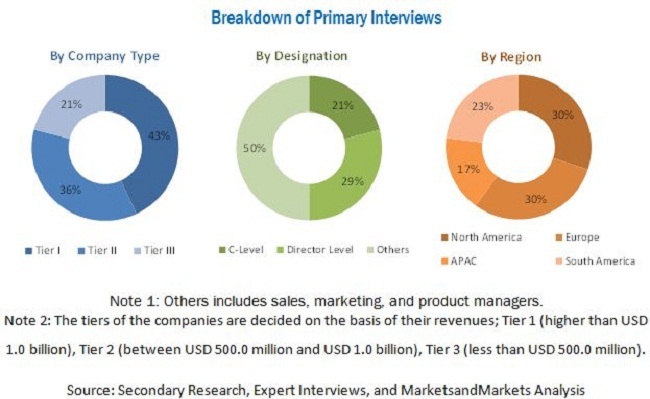 The main objective of the study is to define, describe, and forecast the polyphenylene market on the basis of type, application, end-use industry, and region. The report includes detailed information about the major factors (drivers, restraints, opportunities) influencing the growth of the market. The report strategically analyzes market segments with respect to individual growth trends, growth prospects, and contribution to the total market. The report includes analysis of the polyphenylene market on the basis of type (polyphenylene sulfide, polyphenylene ether/oxide, others), end-use industry (automotive, electrical & electronics, industrial, coatings others), application (filter bag, composites, high performance lubricants, engineering plastics, others), and region (APAC, Europe, North America, Middle East & Africa, South America). The market for polyphenylene resin has been estimated in terms of value. The base year considered for the study is 2017 while the forecast period is between 2018 and 2023. Both, top-down and bottom-up approaches have been used to estimate and validate the size of the global polyphenylene market and to estimate the size of various other dependent submarkets. Extensive secondary sources, directories, and databases such as Hoovers, Bloomberg, Chemical Weekly, Factiva, Organization for Economic Co-operation and Development (OECD), World Bank, Securities and Exchange Commission (SEC), and other government and private websites have been referred to identify and collect information useful for this technical, market-oriented, and commercial study of the polyphenylene market. Some of the major market players in the global polyphenylene market include Toray Industries (Japan), Solvay (Belgium), Tosoh Corporation (Japan), DIC Corporation (Japan), Kureha Corporation (Japan), LG Chem (South Korea), Celanese Corporation (US), Saudi Arabia Basic Industries Corporation (Saudi Arabia), China Lumena New Material (China), and Ensigner (Germany). The study answers several questions for the stakeholders, primarily, which market segments to focus on in the next two-to-five years for prioritizing efforts and investments. This research report categorizes the global polyphenylene market based on type, end-use industry, application, and region. The market has been further analyzed for key countries in each of these regions. The global polyphenylene market is estimated to be USD 3.37 Billion in 2018 and is projected to reach USD 4.99 Billion by 2023, at a CAGR of 8.2% during the forecast period. 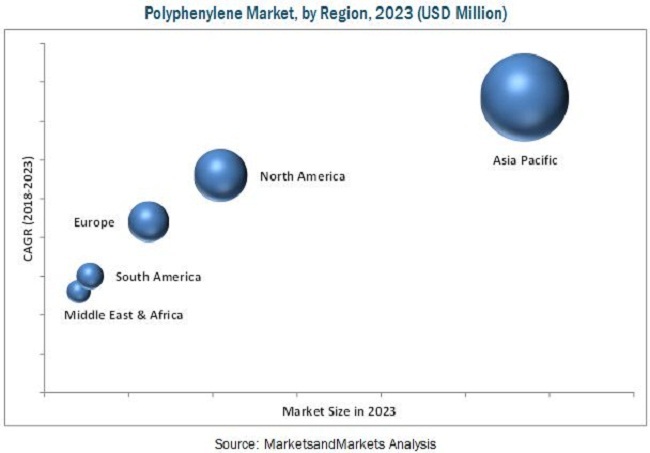 The polyphenylene market has witnessed significant growth in recent years, owing to the growing use of polyphenylene resins in the automotive and aerospace industries, coupled with their increasing consumption in the filter bag application. The main types of polyphenylene considered in the report are polyphenylene sulfide, polyphenylene ether/oxide, and others. Owing to their wide applicability and need for high thermal resistance, chemical resistance, flexibility, and high excellent electrical properties from various end-use industries, such as electrical & electronics and automotive, the polyphenylene sulfide type segment led the polyphenylene market in 2017, in terms of value. Engineering plastics is the largest application of the polyphenylene market, in terms of value. The growing demand for flame retardancy, high heat deflection, and excellent dimensional stability is expected to drive the polyphenylene market in engineering plastic. Hence, this market is expected to witness continuous growth. Polyphenylene are used in various end-use industries, such as automotive, electronics & electrical, industrial, coating, and others. On the basis of end-use industry, the automotive segment is projected to lead the polyphenylene market during the forecast period. North America, Europe, APAC, the Middle East & Africa, and South America have been considered as key markets for polyphenylene in the report. APAC is estimated to be the fastest-growing polyphenylene resin market during the forecast period. This growth can be attributed to the rise in population, the increasing demand for polyphenylene from electronics & electrical and automotive industries. These factors are expected to encourage multinational companies to invest more in the region. Moreover, the region is witnessing economic growth. The polyphenylene market is expected to witness significant growth in the coming years. However, the low heat resistance of separators and various safety issues related to batteries could hinder the growth of the market. Toray Industries (Japan), Solvay (Belgium), Tosoh Corporation (Japan), DIC Corporation (Japan), Kureha Corporation (Japan), LG Chem (South Korea), Celanese Corporation (US), Saudi Arabia Basic Industries Corporation (Saudi Arabia), China Lumena New Material (China), and Ensigner (Germany) are the key companies operational in the polyphenylene market. Targeting new markets will enable manufacturers to cater to the rising demand for polyphenylene resins, hence reinforcing their position in the market.